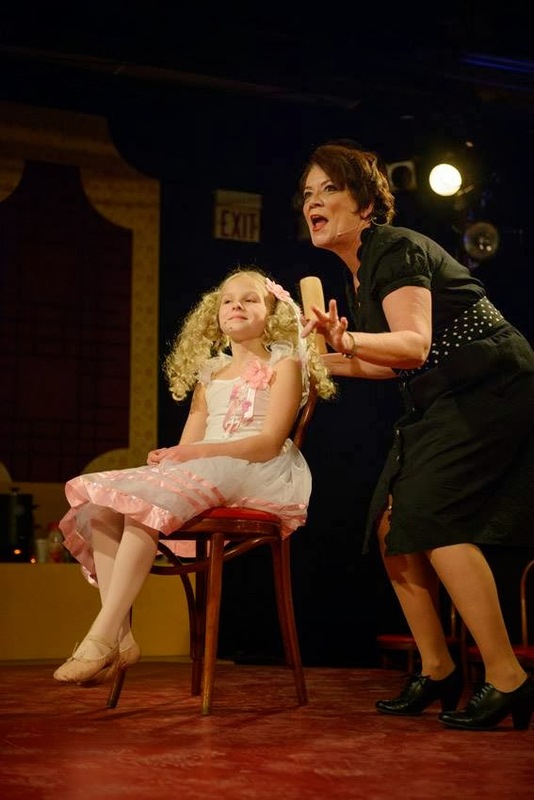 Delaware Arts Info: Let City Theater Company Entertain You! Let City Theater Company Entertain You! When an excerpt of the 1957 memoirs of the stripper Gypsy Rose Lee was published in Harper’s Magazine, it caught the attention of both producer David Merrick and theatre star Ethel Merman. Merman refused to have an unknown composer (Stephen Sondheim) write the music, so they got Jule Styne to create the rather complex and busy score of Gypsy. Michael Gray produced this musical for the City Theater Company to celebrate their twentieth anniversary and created a lively production that is every bit as sharp and poignant as I remember from the giant Broadway production of a few decades ago. The orchestra started quietly and then warmed up with superb cues and panache as they bumped it with great trumpet from Bob Baronio from the small pit orchestra seated in the middle of the courageously raised rectangular round walkway. The spaces behind the seats were also used for stripping, teasing and other exciting burlesque. Men had their heads rubbed, shawls draped over them and 'Mr.Goldstone' was drafted without notice from the audience. (Watch out, gentlemen — you may find yourself on stage!) The only complaint I could make about the stage setup was that if you sit across from the spotlights, you will be blinded. Mama Rose was an unstoppable train as Karen Murdock played the role with a vengeance. Her stage motherness was palpable and she built to a crescendo her desire for fame and success. Murdock’s singing is truly moving, and she took it to the Merman-esque growl with perfection. (Totally different from her tear-jerking solo of Send in the clowns in CTC's 2011 production of A little night music, which is still in my head). Another brilliant move was placing the three Junes and three Louises together to show their physical growth, which Mama Rose never wanted to recognize. Kerry Kristine McElrone used some sort of magic to evince the horror she felt when Mama Rose wanted her to go beyond entertainment to survival. Her small gestures were so dramatic and yet subtle as she remembered her youthful self (appearing on stage) and swallowed it while moving on. And Nicole Hemphill, a veteran child actrress, was a treat as the perfect baby June — following the masterful choreography (designed by CTC longtime choreographer, Dawn Morningstar) of Zachary Chiero’s Tulsa as if she had been waiting for a leader. Dylan Geringer was also excellent at bumping her ballet up to a fine femme fatale. And you ain’t seen nothin’ 'til you see Mazeppa bump it. It is hard to tell whether his instant costume change or his outrageousness is more impressive! The production is about the bawdy, but I recommend it as safe for the whole family as the message is much more about love and ambition than anything else.